I was very shocked to hear that Jack Pickard sadly passed away last weekend. Jack was a prolific blogger who wrote enthusiastically about a huge range of subjects. Web accessibility, Doctor Who, literature, politics, comedy, music, film; he was also a lover of the meme and it was a pleasure to take part in memes instigated by Jack over the years. It was a honour to know that Jack read these pages regularly over the last four years I knew him. He often left comments and I’m grateful for that, and his passion for all things virtual meant regular contact on Twitter, Facebook and the accessible web standards forum Accessify. I even met him once, very briefly, but consider myself only an online associate so my thoughts go out to his friends and family at this tragic time. I sincerely hope that The Pickards remains online for evermore. It will remain a valuable archive of great, witty writing. And the most fitting way of remembering him. Tony Wilson founded Factory Records, rightly famous forever for Joy Division and New Order. He was portrayed by Steve Coogan in the film 24 Hour Party People. A crazy, inspirational guy. In his big hair and bigger collars, he fronted the brilliant So it Goes in the late 70s, and I have several editions on battered video to prove that the excellent Ian Curtis really did exist and wasn’t just something of legend. I take my hat off to Tony Wilson – I always found him interesting, amusing and infinitely wise. So long! Lee Hazlewood was probably best known for writing These Boots Were Made For Walkin’ for Nancy Sinatra. They also recorded several albums together during the 1960s, notably Nancy and Lee in 1968. I have this album on vinyl but have been tempted to download it from iTunes after hearing about his death. He was also instrumental in creating the distinctive Duane Eddy guitar twang, and continued recording as a solo artist until very recently with his final release Cake or Death. But the sixties claim him forever. If you’re looking for a gravelly voiced and dark vision of that decade then look no further. He looked great too. I love Lee Hazlewood because he’s remained on the fringes, not as fashionable as Scott Walker or The Velvet Underground – although he’s arguably more important and influential than his more famous peers. There’s also the country element to his songwriting, an influence evident in current artists such as Richard Hawley. And in the time I’ve taken to write this post I’ve made my decision, downloaded the album and I’m listening to it now. The wonders of modern technology. The wonders of Lee Hazlewood. American planes, full of holes and wounded men and corpses, took off backwards from an airfield in England. Over France, a few German fighter planes flew at them backwards, sucked bullets and shell fragments from some of the planes and crewmen. They did the same for the wrecked American bombers on the ground, and those planes flew up backwards to join the formation. I first read Slaughterhouse Five when I was 15 and it instantly became my favourite novel (before being usurped a couple of years later by Catch-22). Having just read Vonnegut’s classic for the third time, however, it may just have overtaken Heller’s again in my estimation. Slaughterhouse Five is one of those books that you expect everyone to have read, but I’ll try to avoid making that assumption and attempt a summary. It follows the life of Billy Pilgrim, a prisoner of war who experiences and survives the bombing of Dresden in 1945. Billy also travels in time, thanks to the aliens who kidnap and display him as an animal in a zoo, and the novel jumps from one part of Billy’s life to another as he timehops, encompassing his war experiences, his marriage and later life, more war experiences, more civilian life and even his own death. Call it a jigsaw, a jazz piece, interactive, whatever you decide, but Slaughterhouse Five always remains fresh and original. There are almost no characters in this story, and almost no dramatic confrontations, because most of the people in it are so sick and so much the listless playthings of enormous forces. Whenever I reread Slaughterhouse Five I enjoy the opening chapter more and more, where the Vonnegut character sits down to start writing and gives the introduction that provides some snippets of what is to come. It’s one of those books that improves with rereads partly because you do know what is going to happen. Like the fourth dimensional Tralfamadorians and their all-encompassing vision of past and future, and like Billy’s own toing and froing through time, you can view this novel as a whole with no timeline or real beginning, middle or end. But don’t be put off by the time travel element of this novel if you’re not a science fiction fan. Of course, we only have Billy’s word for it that he’s travelled in time anyway (whover he tells about it naturally thinks he’s crazy and it is revealed that he is suffering from the trauma of a plane crash). The fantastic parts of the book somehow add more weight to the depiction of the awfully real events. The controversial bombing of Dresden wasn’t widely known about or discussed much when the novel was first published in 1969; Vonnegut, like Billy Pilgrim a prisoner of war in 1945, witnessed the devestation first hand. His real experiences are weaved into the fiction of the book magnificently, using repetition of phrases (such as ‘so it goes’) and repetition of the haunting incidents in Billy’s life (the execution of a soldier for the triviality of stealing a teapot). 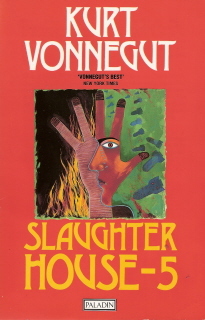 Whatever Vonnegut might say, Slaughterhouse Five is full of characters I will never forget: the disturbingly dangerous soldiers Roland Weary and Paul Lazzaro; the crazy science fiction author Kilgore Trout; the executed soldier Edgar Derby and Montana Wildhack, Billy’s ‘mate’ on Tralfamadore. Best of all is Vonnegut himself as he lurks in the background, who adds a touch of horrible reality – the flamethrowers used to incinerate the dead; the destroyed Dresden resembling the barren surface of the moon. Like shooting the soldier with the teapot, Man does pointless and futile things. And he will continue to do them. I love it, what more can I say? Go on, read it. Or reread it. You know you want to. Freddie Francis was a prolific director for film and television, best known for his British horror films of the 60s and 70s. He worked for the two great production companies Hammer and Amicus. 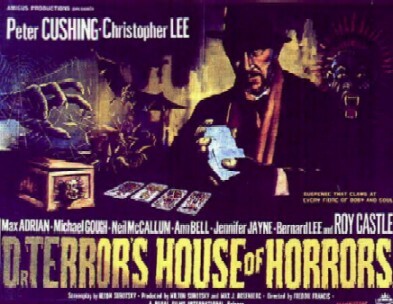 Highlights of Freddie Francis’ directing career, providing me with colourful and comfortable late night horror in my formative years, were Dr Terror’s House of Horrors (1965), The Skull (1965), Dracula Has Risen From the Grave (1968), Tales From the Crypt (1972), The Creeping Flesh (1973), Tales That Witness Madness (1973) and The Ghoul (1975). Although these films are all excellent, he was very much a jobbing director, and there are other films in the Hammer and Amicus canon not directed by him that are equally good. It’s his work as an accomplished cinematographer that has gained him the most respect, including such gems as Room at the Top (1959) and Saturday Night and Sunday Morning (1960). Best is The Innocents (1961), a very eerie and disturbing adaptation of The Turn of the Screw by Henry James. This is always worth seeing, and Francis manages to create a menacing monochrome atmosphere that matches the original book. If you haven’t seen it, please make a point of doing so. David Lynch also employed Francis for The Elephant Man (1980), another black and white masterpiece, and The Straight Story (1999), but I’m only touching the surface of his achievements. See the IMDb for the full story.